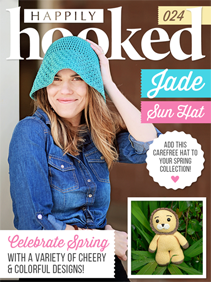 Our very own Salena Baca graces the cover, modeling her Jade Sun Hat–a gorgeous, carefree hat made out of cotton yarn to help keep you cool this spring. 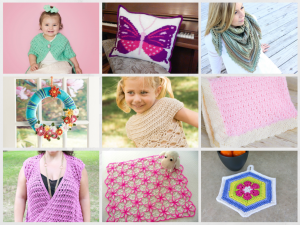 We’ve got patterns for two blankets, an amigurumi, two tops, accessories for your home, and a shawl, along with our “Hooked on” Roundup and a Red Heart Roundup in this month’s issue. Not to mention our stitch of the month projects and our tip of the month! Look at those bright and cheerful projects! Sedruola shares her business knowledge in a timely piece about staying focused on your goals, and we meet Jonathan F., who used crochet to turn his life around, in Crochet Heals! We’ve also got a bit of a surprise for you: we have a new author for our Crochet + Fashion piece, but you’ll have to read the issue to find out who! This is just a peek into this month’s issue. Want to see more? Want to stay Happily Hooked? Get your first issue for just 99 cents! Have you finished a project from one of Happily Hooked’s patterns? Share them with us on Facebook or Instagram with the tag #HappilyHooked!